Taking advantage of a screen recording tool in different cases can bring tremendous convenience to our digital life, with which you are allowed to make a vivid video to show some abstract ideas, grab gaming audio to keep favorite streaming sound, record live chat to preserve impressive words, etc. If you are not familiar with screen recorders in market, you may choose a freeware to try first. However, one big problem of using free screen recorder is that your recording video would always turns out to be watermarked. There is nothing worse than seeing a huge watermark on the screen as it will definitely affect the whole watching experience. Frankly speaking, you may have trouble in looking for a free screen recording tool with no watermark. To get you out of the trouble, here we will show you the top three best screen recorder freeware that can capture your screen activities without watermark. More professional than other recording programs, ActivePresenter is equipped with richer features. The user operating interface couldn't be any easier, making each icon layout tidily. You are able to record a video in full screen or customize the screen size by yourself. Besides, ActivePresenter facilitates you to record your screen with relative ease as well as use the recorded footage. Any desktop videos and audios can be captured in HD quality. 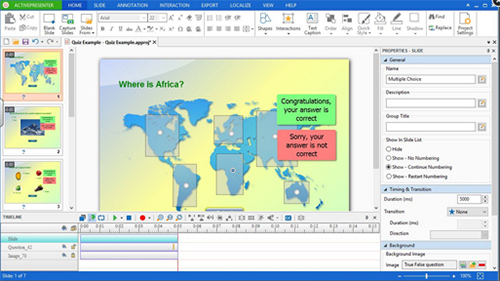 If you want to use ActivePresenter, there is no need for you to worry about its compatibility as it can well available to Windows 7, 8, 10 and macOS X. Furthermore, ActivePresenter can be used to record webcam, which is vital for numerous users. With top-leading video editing tool, you have chance to blur the moving object, cut, trim, merge clips, make text-to-speech, use Chroma key, adjust audio, etc. Certainly, it also makes screenshots taking and annotation adding possible. The supported effects are shapes, lines, arrow, callouts, text, cursor spotlight, etc. Surely, there is no problem for you to customize hotkey. Note that all recorded videos can be output into AVI, MP4, WebM, MKV, PDF, Excel, Word or HTML5 content, but it will come with watermark if you choose HTML5 as output format. Except that, ActivePresenter has no more big drawbacks. What is worth mentioning is that there is no recording limitation so that you can feel free to make any capturing. Being a web-based free screen capture with no watermark, Apowersoft Free Online Screen Recorder is widely used by majority of users, which is compatible with both Windows and Mac OS. With its intuitive and user-friendly interface, you will obviously have a feeling that it is easy-to-operate with only few clicks, requiring no Java script. Apowersoft Free Online Screen Recorder can be used to capture definite area with adjustable frame or directly record full screen. It enables you to record video and audio from your PC screen simultaneously, from which a webcam video can also be supported. During the recording process, sounds from system and microphone will be captured as long as you have this demand. Alternatively, it provides you with various optional modes. You can take screenshot, create a recording task, edit the video, convert it to MP4, WMV, AVI, FLV, MPEG, VOB, ASF and GIF and then straightly share it to YouTube, Vimeo, Google drive or Dropbox. In addition, Apowersoft Free Online Screen Recorder is capable of setting up hotkey, video quality together with audio codec. Most importantly, there is no recording time limitation so that you can capture any screen activities at discretion. To delight you, it is well developed without adding watermark to your captured files. When share your recordings to friends, you don't have to worry about the influence of watermark. With simple operating interface, Icecream Screen Recorder has access to not only capture video, but also take screenshots, which includes full support for selected-region as well as full-screen capturing. 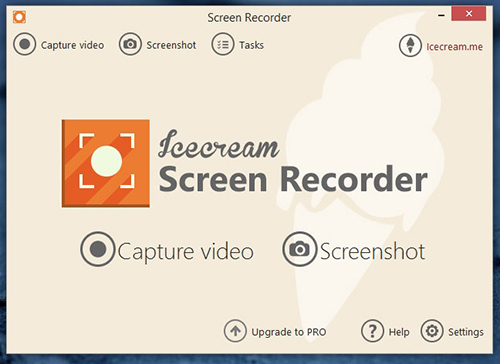 Similar to other recording software, Icecream Screen Recorder offers ability to record both audio tracks and videos at the same time. It enjoys high popularity among PC users who are using Windows operating system. Before you record a video, you are entitled to configure settings, such as hotkeys and audio source. The destination recorded files can be saved as MP4, WEBM along with MOV. Even if you are not in front of your PC, you can record a video by presetting a task to capture screen automatically. Aside from that, you are allowed to take screenshots at any time and draw outline on the screen. Essentially, Icecream Screen Recorder can be utilized to annotate videos in real-time. That is to say, during recording process, any marks can be added to your screen. Simple as it is, you may be faced with some problem. Among them, you may not be satisfied with the time limitation, which only permits you to make a recording up to 10 minutes. Additionally, there is no video editing tool for you to manage your captured videos as well. Looking for more powerful recorder with diverse features? 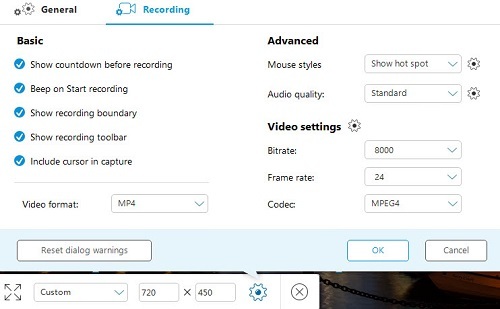 Even though it is necessary, particularly for new beginners, to find a free screen recorder without watermark, a screen recording tool with professional designs as well as flexible functions should also be taken into consideration. Here if you are a senior user, you may have a need to know one more program, called Joyoshare Screen Recorder. It is a full-featured screen recording that is available to capture any video and audio activities on your desktop screen, including streaming music, Skype video call, online radio, game tutorial, webcam video, interesting movies, etc. Any output formats and devices are supportable for your video recording and audio capturing. Joyoshare Screen Recorder is well designed to cater to different needs, which allows you to choose desirable output format, take screenshots anytime, make use of shortcuts, preset a scheduled recording task, trim video based on your requirement, etc. In despite of its watermark on free trial version, it is a satisfying program considering a wide range of options. If you have interest in it, try its free trial version as you like.